Disclosure: This is a review of the advanced reader's copy ebook provided for review by Penguin's First To Read program. All thoughts and opinions are my own. My Thoughts: I really liked Emily Henry's latest novel. 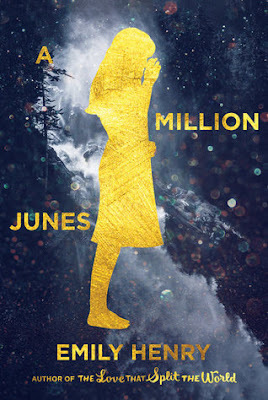 "A Million Junes" is a young adult fantasy that has a Romeo and Juliet vibe to it. The main character, Jack (June) O'Donnell, lives in a house where magical, other-worldly things happen. There are ghosts that lurk about, some good and some evil, and strange creatures called coywolves, who like to steal shoes. June's family has been in a feud with a neighboring family for decades and she ends up falling for Saul, the boy from the rival family. June does not know why her family is at odds with the neighboring family and she sets out to uncover the secrets that her family has been hiding for generations. This is the first book from Emily Henry that I've read and I found this story to be quite intriguing and touching. I loved the relationship between June and Saul, and I loved the fantasy elements of the book. I found the main characters likable and interesting, and that book cover is gorgeous! However, it took me a long time to read this, even though the author's writing style was a pleasure to read. Maybe I've just been reading too many books at once and it's hard to focus on one story for too long? I'm not sure why it took me forever to get through this book, but I did enjoy the story. This novel has magic, romance, and mystery; and you should definitely read this if you love young adult fantasies with appealing characters. March Book Outlet Haul! 35 Books! !